Color Sweet Tooth: Am I Back? I took time away from blogging because I felt my art and life were becoming a performance, and I was no longer even the one writing the script. This permeated most parts of my life at that time. So I stopped blogging and tried to draw and paint without an audience. In fact I haven't drawn or painted much - some sketching, a drawing or two, a few watercolors. Like the painting above - but more on that later. Like the self assembled Neapolitan ice-cream desserts I've been having in a tiny blue and white bowl after dinner. I carefully combine equally slim teaspoon scoops of chocolate, vanilla and strawberry Talenti ice cream, always in the correct order, so I can take spoon-nibbles of all three flavors. It's the right amount and it brings back memories of childhood when this was one of the more interesting flavors available. The three flavors never mix, but rather blend like harmony in the mouth. I love dishes that do that. Like leaving work today and getting into my Infiniti coupe, with the black leather interior (her name is Anginetti, and I also call her Ginny or Cookie) which had to have been 110 degrees. I open the glove box and (always with a grin) got out my black deerskin driving gloves (not an affectation, they improve my grip and let me relax my hands more on my long commute - and what else should you have in a glove box?) which were also 110 degrees. I'm lucky the pipsqueak (another nickname) has as powerful an AC unit as her lovely growly engine. I like nearly everything about my commute. Including the podcasts I listen to when I'm not listening to home-made mixed CDs (more on those in subsequent posts - we should all be telling each other what music is turning us on - it's still far too hard to find new exciting music). And today, on my way to buy jeans before going home (more on that below) there were small squalls blowing in from the southwest. They left towering precarious looking clouds, some backlit brilliantly against a slate grey gloom and others nearly black silhouettes against the sunlit cauliflowers of more distant banks. I gawked openly as I crossed the mall parking lot, amazed at the mile high profligate outpouring of lights and shadows and gorgeous organic shapes, and I said aloud, as I often do, "What an astonishingly beautiful planet." When I am buying jeans I want them in several colors, but the REQUIRED color is traditional indigo. I like them faded or not faded, but I don't like the gasoline variety, or black, or blues so dark they border on a combination of Prussian Blue and Payne's Gray. Those are not American colors, and I think of "blue jeans" as the quintessential American garment. I wear them all year, no matter the heat. I think of my personal uniform as a time faded plaid flannel shirt tucked into blue jeans with a contrasting color tee shirt peeking out through the collar. I finally found what I wanted in a couple of pairs of Lees - I haven't owned that brand in decades. I grinned at some Wranglers (what I wore through most of my childhood) but the material is noticeably thinner. I tried on some Levi 505s - they don't hang well on me and I have never liked Levi pockets. They don't get pockets. I'm absent minded and carry two full sets of my keys, too many pens, and a fat wallet - I need real pockets. I stopped drawing nudes about a year ago. Drawing from the model was amazing, frustrating, intoxicating, and discouraging. I stopped when I realized I was not breaking into anything new, and the beauty before me was beyond my ability to capture or even hint at it. I took from the experience some improved ability to see and to draw, and a lasting awe of the near perfection that is the human form, particularly the female form when gravity reveals the draping of flesh on bones. Hips and shoulders can pause the world. I have taken to drawing before bed, with no purpose, no plan, and no conscious control, in a bound notebook from a disheartening company. I consider it an act of redemption - redeeming part of my past and redeeming the pages. I do the drawing with a pencil designed by Louise Fili, called a "perfetto" (it really is), graphite on one side and red on the other. I watch my hand create shapes and lines that might as well be produced by someone else, but I recognize them as mine. They seem to know when they are finished. They seem pregnant with meaning, but they are not talking to me. Finally, about the painting above... On a recent mountain vacation I put down some strokes of pure colors, also with no plan. I was using an unnamed brush (Louise was too small, Tilde was MUCH too small, and Frondine was too big). I stopped after only 5 minutes, with some orange circles, some pink shapes in a line, and green and blue coming up from the bottom. It went home in that state while I finished Sycamore House (another post later). This last weekend we bought a bouquet at the farmer's market filled with rudbeckia, a small sunflower, speedwells, and coreopsis of the sort where every stem has a different combination of reds and yellows. The last make me vibrate inside, as do an array of different color seashells on a beach (like periwinkles, or ribbed arcs) or the different colors of the small velvet oak galls on white oak trees up north. I used to feel the same way about the colors in a bag of peanut m&m's prior to the addition of blue. Yellow, orange (nearly the perfect orange - just a bit too opaque and a bit too tinted), red, light brown, dark brown and the shock of green. All a fan of analogous colors with one stand out (green). Blue destroyed that perfect tension and they dropped the beautiful polished wood color of the lighter brown, so while I still eat peanut m&m's I no longer get that inner vibration. ANYWAY... 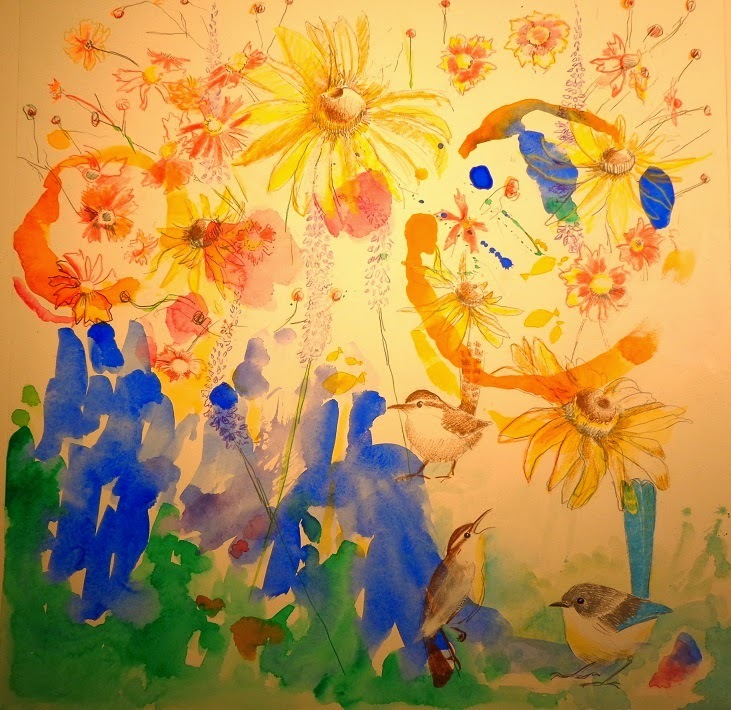 I brought the bouquet to my studio space, set it before me, pulled out the incomplete color splashings, and again, with little purpose or conscious attention to composition, scribbled coreopsis and black-eyed susans and purple speedwells. Then I added two wrens and a fairy bluebird (they're Australian - with a tail I might have designed if I were fashioning birds). I allowed the vibrations of the coreopsis and the perfetto pencils and some prismacolors to just do their thing. I still recognize it as mine, but I have no idea what I was doing. It felt closer to childhood art than I have been able to get in years, and it felt like a glimpse of the inner garden. I have no idea how to finish it, or if it needs anything else. It just was and is. I sometimes get so distracted driving around these mountains by the beauty of it all, the way the light hits the trees, the way the clouds hang in the sky, the way the land rolls and houses are tucked into it. I sometimes think, "I appreciate all this beauty because I was a botanist for three years, and I was constantly looking at nature," but then I see the beauty in someone's smile or wrinkles, or the way a railroad bridge crosses a river, and I think, "I appreciate this beauty so much because I was brought up by artists, who taught me to see the world differently." I think it all began with you and was merely refined by my training as a scientist. It adds another layer of meaning to everything I do.